Knowing that this was Heath Ledger’s last film, and indeed, that he passed away during shooting, I’ve been hesitant to watch it. Even knowing it’s a Terry Gilliam film and that filming was resumed with Colin Farrell, Jude Law and Johnny Depp, I still couldn’t bear it. I suspected (very wrongly) that it would feel unfinished, or, at best, half-arsed. As is often proven, I’m an idiot. Of course the perfectionist Terry Gilliam wouldn’t release a poor product. There is a travelling theatre stage on the back of an old-fashioned horse-drawn caravan that appears in random locations. 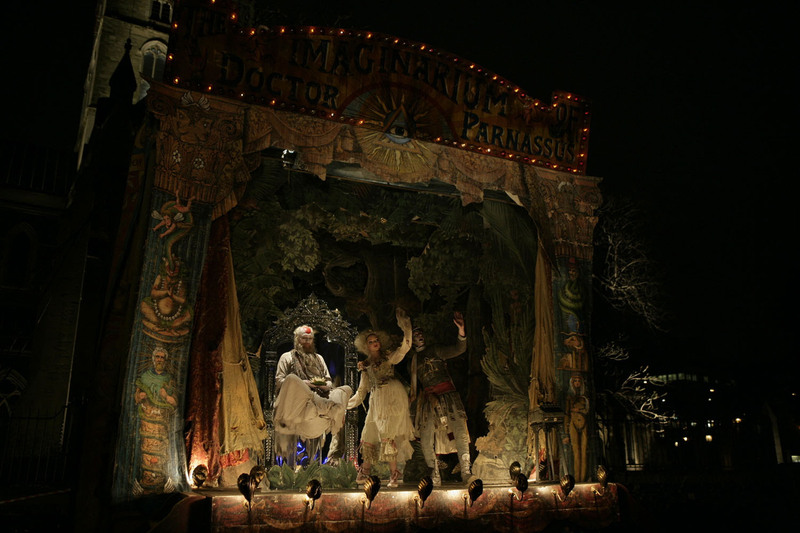 The feature act is Doctor Parnassus; the thousand-year-old man who provides a unique experience to anyone who enters. But it is running into the ground in the modern age as it has not updated – until the appearance of the hanging man, Tony (Heath Ledger). There is so much more to the plot, but I think you should just watch and enjoy. Be aware, though; it’s crazy and nuts, with unreal worlds hidden from view, and you really need to suspend your disbelief to enjoy it. The Imaginarium of Doctor Parnassus was nominated for Oscars for Best Achievement in Costume Design and Best Achievement in Art Direction.